When people think of Hungary they think of amazing architecture and possibly good wine but certainly not beer. Hungarians keep most of their best wine for the domestic market and don’t seem to export their beer. By chance my visit to Hungary coincided with the Sorfesztival, a celebration of Hungarian mainstream and craft beer, also offering some decent stuff from Belgium, Germany, the Czech Republic and even Brewdog. The majority of Hungarians seem to drink lager and dunkel style beers but under the surface there is a growing interest in craft beer and small breweries are experimenting with less traditional styles. 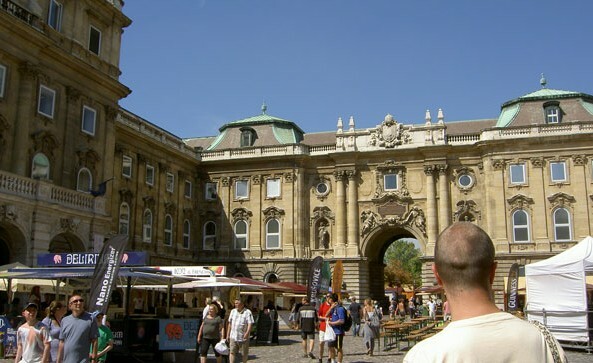 The Sorfesztival (29 Aug- 2 Sep) took place in the spectacular location of Budapest castle, east of the river Danube in the Buda part of the city. The castle was worth exploring and its courtyards provided an ideal backdrop for the beer festival. 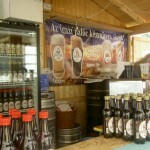 Each brewery had its own wooden stall with the majority serving draft beer and the odd one offering bottles. So was the beer any good? Well the majority was pretty average but one or 2 offerings were worth seeking out. Armando Otchoa runs the beer shop Csak a Jo Sor (Only good beer) and his Grabanc IPA was supposed to be available at the festival. Despite searching every inch of the courtyard, disappointingly I couldn’t track it down. When I met Armando a few days later he informed me that his latest batch wasn’t ready for the festival and would only be available after I had left town! I started the festival with Sefforas IPA; the first IPA brewed in Hungary and a pretty flat, watery affair on this showing. Next up was Koleses Sor, a pale, refreshing beer ideal for the hot weather. The festival took a turn for the better with a visit to the Bors brewery stand. Despite all their beers being bizarrely named after characters from Robin Hood, they certainly seemed to make some of the more interesting craft beers available in Hungary. On draft Little John pale ale was a bit cloudy but still had plenty of flavour. The bottle version was even better, a bit yeasty with nice hints of fruit. 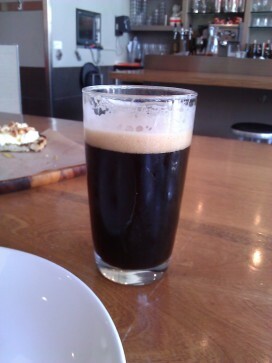 Tuck Barat a Belgian style double, was a tasty, well-balanced affair with hints of caramel and dark fruit. The Bors brewery is still a work in progress but they are definitely a brewery worth watching and their beers are well worth trying. 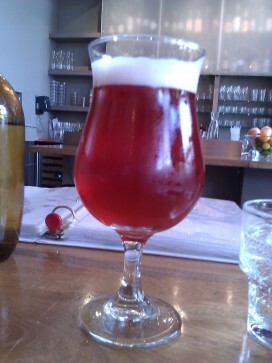 Next, the Gyertyanos Kriek was a nasty cherry beer best avoided. This was followed by Buza from Szeles and Szeles, an instantly forgettable wheat beer sold in plastic bottles by the likeable brewer. 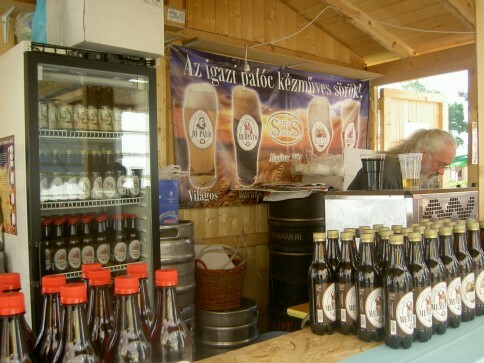 The beer of the festival and probably the best Hungarian craft beer of the trip was Keseru Mez brewed by Foti. This was a well-balanced, honeyed beer with fruit notes and a subtle hop bite which was quite moreish. 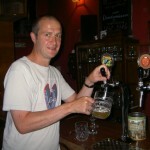 It was popular with the locals in Skanzenclub and also came in decent 500ml bottles. The Sorfestival cost £7 including a couple of beers and was an enjoyable affair and a good introduction to Hungarian craft beer. It also provided a chance to wander round the grounds of the fantastic castle. The Hungarian scene is still in its infancy but a couple of breweries have the potential to up their game and enter the export market. Budapest does have some great bars worth visiting to escape the generic mass produced lagers that dominate the city. Csak a Jo Sor is a small but excellent beer shop/pub run by the knowledgeable Armando. The shop sells some of the best Hungarian beer and also has a good selection of craft beer from heavyweights including De Molen, Brewdog and Flying Dog at very reasonable prices. The fruit beers from the Bekesszentandrasi brewery were definitely worth trying, especially the plum beer which was extremely refreshing after traipsing round in the hot summer sun. 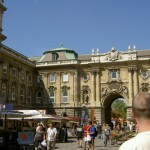 Other places worth checking out in Budapest include Skanzenclub, Bier Beer, Piratos Pub and the IF Café. Skanzenclub in particular was really fun. It is an unlicensed pub which doubles as a tobacco museum where you pour your own pint and pay for it in a collection tin. The bar served really good draft Kesuru Mez and the local crowd were very friendly. Budapest is certainly a great city to visit and although the Hungarian craft beer scene is very much a work in progress, if you search around you might find something worth drinking. For a small operation, Haandbryggeriet has certainly produced a wide range of beers – from a wheat stout called “Dark Force”, through an Akevitt barrel aged porter, to a hop-free Gruit beer made with herbs, brewed as a guest beer in cooperation with the de Molen bewery. Norwegian Wood is a Haandbryggeriet beer available at Port Street Beer House on tap, and is brewed all year round. 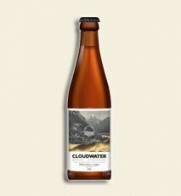 It’s a traditional Norwegian beer that has been recreated in memory of the farm brews that abounded when old laws required them to produce ale (farms were sometimes confiscated and went to the church and the king if they didn’t). In fulfilling their requirements, the farms usually kilned the malt over an open fire, giving each brew a smokiness that has been recreated here. The brew was enhanced with the traditional spice for all Norwegian beer at the time – juniper. The juniper spice comes not only from the berries themselves, but also from the twigs that are placed in the mash tun. So many miles and years away from these traditional Norwegian farms, I sit here with a serving of Norwegian Wood. As I observe the hazy copper colour and the fading creamy head, there’s an intense aroma of pine and smokiness. Not an unpleasant or strong smokiness, but something more subtle, akin to pipe tobacco. There’s a taste of pine and a hint of cooked juniper berries, and rather than smoky, the flavour is more nutty and slightly sticky sweet, with an undercurrent of charcoal or cinder. The first sips also had a fruitiness about them but towards the bottom of the glass this had been replaced with a decent hint of malt that was very pleasant. 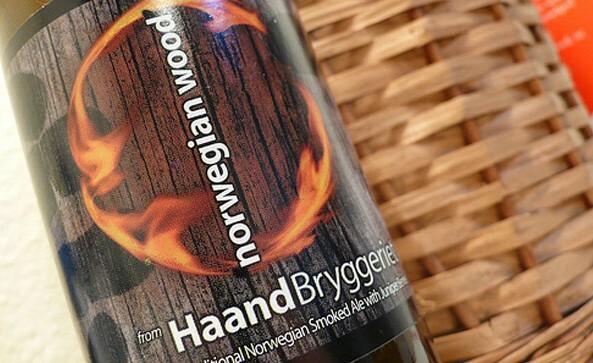 Haandbryggereit brews Norwegian Wood with smoked malt from Germany, along with other malts including crystal and chocolate. There’s a wealth of aromas and flavours in a small glass of this traditional ale, and the smokiness is by no means the dominant feature. I wouldn’t describe myself as a fan of smoked beer in the classic “Rauchbier” sense, but I definitely would order this again. With pine, hazelnuts, juniper and cinder in there, this beer is not only a mouthful to pronounce, but a very pleasant mouthful to enjoy. Well it’s taken me a while to finish this off but here is the second instalment of my ‘tales from the ‘moon’. 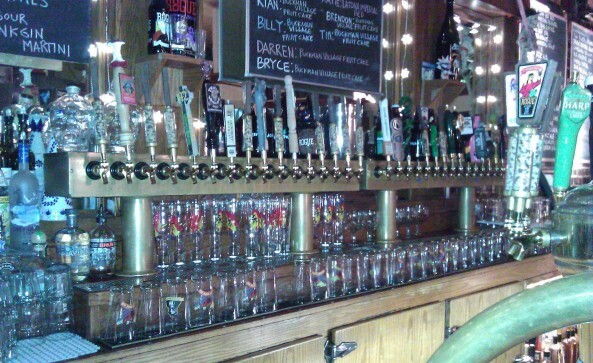 The amount of amazing beer around in San Fran is ridiculous, being a serious beer lover I was in heaven. Once we’d recovered from the long flight our first port of call (pun intended) was the ‘Ferry Building’, we started our day with some ‘Blue Bottle’ coffee, these artisan roasters really know what they’re doing, the coffee was excellent. The Ferry Building houses a wealth of independent businesses selling everything from pottery to wine. That evening we booked into ‘Foreign Cinema’, an outdoor restaurant that projects films onto a large wall outside in the aching cool Mission district, we popped into the bar beforehand only to hear Stone Roses on the Jukebox, typical! I spied ‘Lagunitas IPA’, this now famous beer has been on the lips of craft beer geeks for a while now, so I thought I’d better see what all the fuss was about. To be fair, it was fantastic, no heavy caramel malt base and searingly hoppy, it was bordering on a perfect IPA and I don’t say that lightly. 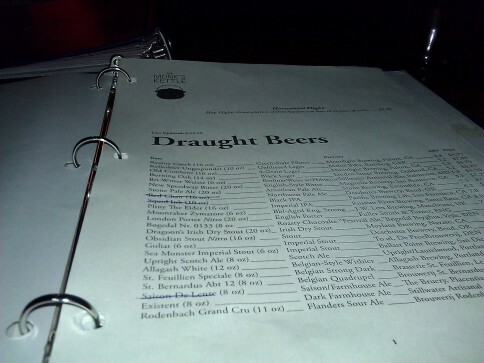 After dinner, on a recommendation from a bartender we hunted out ‘Monks Kettle’, a gastropub in the Mission District with an excellent draft menu, they even had J.W Lees on. I treated myself to a Existent, a saison noir brewed by Stillwater and from what I remember tasted great, it was getting late after all. The next morning we hunted down Ritual Roasters, great coffee but alarmingly arrogant baristas, they took being aloof to the next level. We wandered down Valencia St, towards the Mission District to hunt out yet more coffee. We stumbled across Fourbarrel Coffee, the place was buzzing, coffee being hand roasted in the back, people sipping single origin coffee filter coffee out front, I loved that place. We then popped to Little Star Pizza, they served up potentially the best pizza I’ve ever eaten, all washed down with Bear Republic ‘Racer 5’ on draft. I’ve never been blown away by ‘Racer 5’ when I’ve come across it in the UK, but fresh on draft it was delightful, a harmonious balance of west coast hops, American pale & crystal malts. 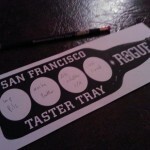 That evening we were pretty pooped but I managed to drag the wife to the Rogue Tap in North Beach, it had the quintessential ‘sports bar’ vibe with baseball on big screens, not really my scene but we were there for the beer. I tucked into a couple of IPAs and then went for a beer recommended by the bartender, Buckman Village Fruitcake stout, a rich stout with loads of malt, stewed and candied fruit. 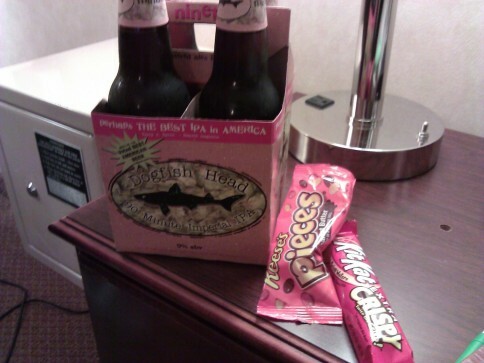 I was really impressed with the customer service at Rogue, really polite and knowledgeable, but that was us done for the evening so we went to the shop, picked up a four-pack of Dogfish 90 minute, some Reese’s and a weird Kit Kat, Dogfish from the off-licence! On our penultimate day we went unto the Marina, a very OC type of area, lots a beautiful people and loads of high-end shops. We went for lunch in Delarosa, within minutes the manager and I were talking beers and weddings, I can’t speak of the staff there highly enough, attentive and really well trained. 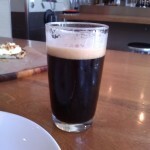 The manger mentioned the beer I was drinking was by a brand new local brewery, it was a ‘Squid Ink Black IPA’ from ‘Pacific Brewing Laboratory’. A heavily hopped black IPA with hints of tobacco and an amazing mouthfeel with squid ink to help with the colour. By chance Patrick Horn, the brewer, walked in doing the rounds and picking up empty barrels, the manager introduced me and he joined us for a healthy beery discussion. 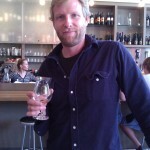 What a great guy, passionate and very knowledgeable, he even treated me to a half of his Hibiscus Saison, it was great stuff, dry, aromatic with a hint of astringency, not to mention it was bright pink. I’ve already been in touch with him about trying to get his beer over here, he’s still only contract brewing but saving up for a kit of his own, one to watch for the future though. After a lovely afternoon we went to another bar in North Beach called ‘La Trappe Cafe’, a pretty typical take on a Belgian cafe, dark, moody lighting, great beer & belgian frites and a great draft selection. Jolly Pumpkin, Pacific Brewing Lab, Brasserie d’Achouffe and Alvinne, I was instantly drawn to the latter having never seen it on draft in Europe never mind the states. I went for the Alvinne Sour and it came in at a handsome $14 for 8oz, less than a half a pint, not only that but it was served by a bartender with a serious attitude problem. When I tasted it, it was completely devoid of any condition or carbonation & yes it was sour, but an acrid sour, I didn’t drink it. I went back to order Jolly Pumpkin Madrugada Obscura, which more than made up for the Alvinne’s poor showing, a Belgian inspired stout matured in oak with wild yeast, what’s not to like about that sentence? Absolutely amazing! Our final day arrived and with this we went back to our favourite haunt again the Ferry Building. 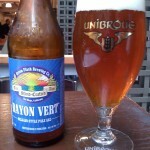 Here I had what was to be my favourite beer of the trip Green Flash ‘Rayon Vert’, this Belgian style pale ale had everything, a big hum from West Coast hops and the tang of Brett from the bottle conditioning. It was delicious, a real mash up of brewing traditions & techniques, basically what every American craft brewery stands for. Well that was the end of my days in San Francisco. Next stop NYC. 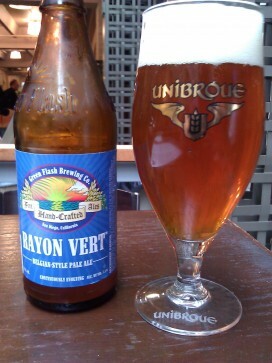 Green Flash Rayon Vert in bottle. 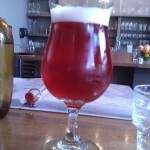 Jolly Pumpkin Madrugada Obsura on draft. Words by William France, dictated not read. The story of US micro brewing or craft breweries usually goes something like this: homebrewing became legal in 1978 and within a few years, US homebrewers started opening their microbreweries and it exploded from there, with their beer styles eventually crossing the Atlantic and strongly influencing the latest generations of microbreweries starting up here. However, on a recent graduation-related trip to the USA, the better half and myself found that particularly in the Northeastern US, this is far from the whole story: in fact it’s somewhat backwards. In this article, we will relate a very cursory history of how many early USA microbreweries and brewpubs looked to the UK to get their start, of our lasting influence on their micro breweries, brewing techniques, and beer styles and then a little about the breweries we got to visit and some of the beers we tasted (all in the name of research, of course, as we’re keen homebrewers ourselves). Particularly influential in New England and the Northeast has been UK ex-pat and University of Manchester graduate Alan Pugsley. After graduating with a degree in biochemistry, and with no clear idea of a career, he began working with Peter Austin who had brewed at the North Country brewery in Hull for decades, before retiring and opening his own Ringwood Brewery in Hampshire in 1978. It was one of the earliest UK microwbreweries and its staple beer soon became Old Thumper, a pale ale, still popular to this day. Austin relied on a yeast strain he’d brought with him from the brewery in Hull, which in turn had come originally from a brewery in Halifax. Now known as Ringwood yeast, it’s a top-fermenting yeast consisting of two distinct strains: one fast to start fermenting, the other quick to flocculate (drop out of suspension in the wort yielding a clear “bright” beer). Like many traditional Yorkshire yeast strains it evolved to ferment in open vessels—the Yorkshire square being one famous example of an open fermentation vessel. Ales fermented in this manner gain greater flavour character from the yeast than those sealed into cylindroconical fermenters, often under pressure. However the yeast’s flocculent nature means it often goes dormant before the wort is fully fermented and thus requires rousing either with a paddle (which is easy to do with an open fermenter) or via pumps and shower heads. Open fermentation requires careful hygiene control due to the exposure to wild yeasts and bacteria in the air. 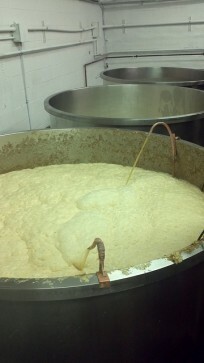 Ringwood yeast quickly starts working its way through the wort sugars and hence out-competes unwanted air-borne yeasts. It also seals in the beer with a thick krausen crust, further protecting it until, after about a week, it can be racked from the bottom. 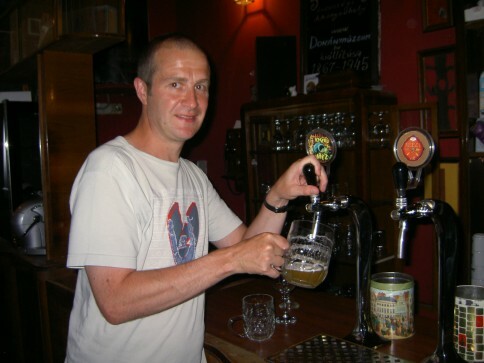 With the success of the Ringwood microbrewery, Austin and Pugsley consulted on setting up new breweries all over the world, including places as far afield as Nigeria, China and Russia. It was through this venture that Pugsley found himself in the USA. They first helped set up Geary’s in 1983 — at that time, there were only 13 microbreweries in the United States, almost all of them in the Western US. Geary’s was New England’s first microbrewery and Pugsley installed a Peter Austin brewhouse and helped design its first beer. Pugsley continued setting up Austin-style systems around the world, and launched Pugsley Brewing International, with the equipment prepared in the UK and then shipped to wherever the new brewery would be built, and then put together by Pugsley. 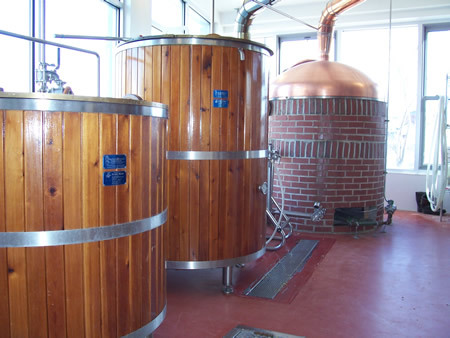 Characteristic of Peter Austin brewing systems are the brick brew kettles with copper domes (see picture above) and of course the open fermenters, and the use of Ringwood yeast. The size of the brewing system may vary, but the brick kettle and open fermenters are standard components. In the Northeast, Pugsley helped launch breweries such as Middle Ages Brewing Company, Gritty McDuff’s (the first brewpub in Maine after Prohibition, opened in 1988), Montreal’s McAuslan Brewing, which opened in 1989, The Golden Lion Pub and Brewery in Lenoxville, Quebec (brewing since 1986), Granite Brewery in Halifax, Nova Scotia and Toronto, and Magic Hat Brewing Co, and many more. 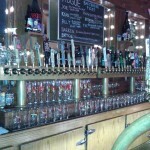 Middle Ages Brewing Company, in Syracuse, NY is one of Pugsley’s influenced breweries. 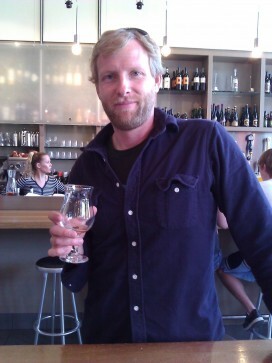 Owner and brew master Marc Rubenstein attended Pugsley’s brewing school in Maine, and started Middle Ages in 1995. The brewery uses Ringwood yeast and open fermenters (see photo below), and produce a number of their beers for cask distribution. Ringwood lends itself to cask production, as the flocculent yeast drops out quickly. Middle Ages condition their beer at the brewery, to minimize cellaring problems in the bars that do accommodate cask ales. Annual production is 727,000 litres. 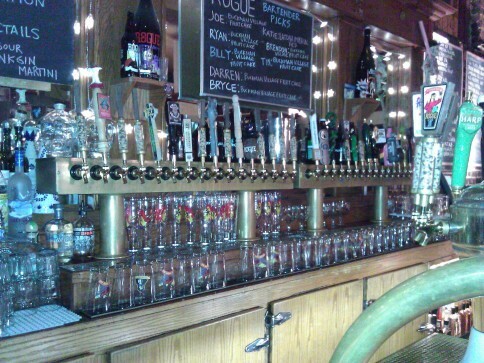 Typically, US bars that do have a British beer engine will only have one or two, at most. 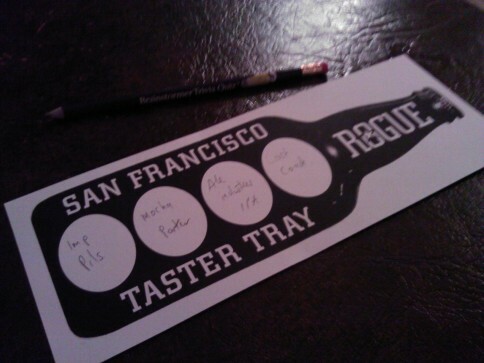 (More of a cask vs. keg experience in a bit). 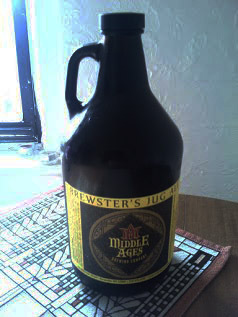 Visiting the Middle Ages brewery is always fun, and became a perk whilst I was a post-graduate student in Syracuse. Because it’s not a brewpub, New York licensing laws do not allow it to sell beer, but it can offer samples in its tap room and shop. While the sampling cups are small, they are constantly refilled, and most punters turn up with their growlers (see picture below), to have filled and take home. The shop also sells six packs, mixed cases, and 650 ml bottles. Between eight and ten beers are available for tasting, and a further five more for “growler” fills only. These lovely vessels hold about 3.5 UK pints, and are best consumed within a day or two of opening, as some of the fizz does escape. On Friday and Saturday afternoons, the tasting room is usually packed with a crowd of regulars, and it’s easy to while an hour away, sampling and re-sampling beers, whilst having a chat. The beers have rather whimsical names (the owners are Monty Python fans, apparently), “Wailing Wench” is the flag ship strong ale, at 8% ABV, and “screaming with hops.” It seems my hop tolerance or palate has grown by leaps and bounds, because I didn’t find it especially hoppy, but the mouthfeel and overall wonderfully balanced flavours are just right. Goes down rather easily, which, given the need for driving in smaller US towns and cities is not advisable. Another favourite: “ImPaled Ale.” Not surprisingly, it’s an IPA, and ever so drinkable, though at 6.5% not exactly a session beer, or not a typical session beer, perhaps—full of delicious cascade hoppiness. I think we particularly enjoyed the Apricot Pale Ale (4.5%, their weakest offering), Winter Wheat (6.3% subtly spicy), ImPaled Ale… and then had the growler filled with their “Tenth Anniversary” American Double IPA. Ten American hop additions are made during the brew, making for a deliciously hoppy IPA (10% ABV). If you find yourself in Syracuse, do pay them a visit. 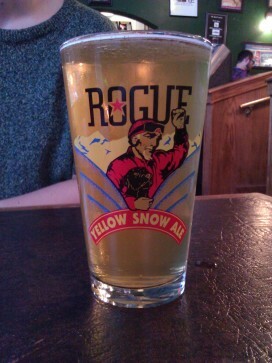 You may not remember all the beer you tasted, and require a designated driver or taxi, but it’s well worth the effort. Graduation engagements, unfortunately, got in the way of us attending a 25-cask beer festival (see picture below) at another local establishment — of course cask remains a bit of a curiosity there, but it’s interesting to see that breweries as well as consumers are increasingly keen to try cask, a trend worth watching. At this point, a slight tangent: beer pricing in the US. It can be summed up thusly: if you buy beer at the off licence or supermarket, it’s generally pretty affordable, especially if it is locally (a slightly loose interpretation of local, Northeastern US is probably more accurate) micro brewed beer (Middle Ages, Ithaca Brewing Company, Long Trail Brewing Company six packs all ranged between $8 and $11), while Dogfish Head’s 90 Minute IPA clocked in at about $15 for a four-pack. If you’re investing in “bombers” (650 ml bottles), prices can vary greatly, but we found Brooklyn’s Sorachi Ace for $7.49 at an off licence, but if your choice comes from further afield, then not surprisingly, it will be pricier. Overpriced, at $20+ was a Sam Adams seasonal, which we were tempted by, but the helpful salesperson at an extraordinary petrol station said it wasn’t worth the money. 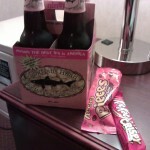 Sorted, Sam Adams skipped. The petrol station was extraordinary indeed, with its huge beer selection, including Lagunitas, Jolly Pumpkin, Pretty Things, Dogfish Head, Great Divide, oodles of Mikkeller, Nørrebro, Unibroue, and many, many more. The number 800, as in 800 bottles in stock, seems to have been mentioned. Spoiled for choice. Enough of prices, more of beer! On to the cask vs. keg comparison: One evening, I chose a pint of Ithaca Brewing Company’s “CascaZilla.” Perhaps the name should have clued me in from the start: have it on cask! Ithaca Brewing Company started in 1998, in Ithaca, NY, which is home to Cornell University and located in the Finger Lakes region, generally known for wine. However, the “casca” part in the name refers to a gorge in Ithaca called Cascadilla, not “cask,” and the “zilla” part is due to the “monster” amounts of Cascade, Crystal, and Chinook hops used in this hoppy red ale. It’s further dry hopped with Amarillo and more Cascade. On keg it was OK, though it seemed a bit muddy to me and not much more than the bittering hop character emerged. 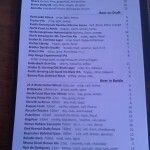 I soon switched to ImPaled Ale and gave little more thought to CascaZilla. Fast forward two days, in another bar, CascaZilla is on cask. And it was nothing short of amazing! 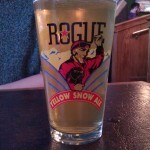 The hops seemed to jump right out of the glass, and it was just at the right temperature, with a great, rich mouthfeel. Sparklers aren’t very common over there, so the only thing lacking was the creamy mothfeel. At 7%, it didn’t seem overly boozy, certainly not on keg, but neither in its cask iteration. Possibly one of the best beer experiences of the trip. As our journey continued to Vermont, we called in at Long Trail Brewing Company, in Bridgewater Corners. Founded in 1989, their unfiltered yet bright Traditional IPA (5.9%) is delicious, made with Nugget and Cascade. The Double IPA (8.6%, 86 IBUs) does not taste as strong as it is, and the Chinook and Cascade hops give it a surprisingly sweet hoppy taste. Another treat: The Pale Ale (5.7%, 35 IBUs) features Centennial and Cascade, and is wonderfully refreshing. Widely available in New England, northeastern US, and Virginia. Long Trail subscribe to ECO Brew, Environmentally Conscious Operations, recycling and reusing materials as much as possible. Up a flight of stairs, the visitor can access the brew house for a little self-guided tour. Upon entering, the bottling line is just below, and along the raised platform are information boards that detail the brewing process. Longtrail uses the typical conical fermenting vessels and had all its kit neatly labelled to facilitate the self-guided tour. Whether visitors can watch the brewing or bottling in action, I’m not sure, but it may be too noisy and dizzying to watch the bottling line. We also visited the Windsor, Vermont plant of Harpoon Brewing Company, Harpoon bought this facility in 2000, where they brew 6.4 million litres of beer per year. (Not surprisingly, Harpoon ranked 8th in US craft brewing sales in 2010). While there wasn’t a guided tour, again, a part of the brew house allowed the visitor to learn about Harpoon’s operation, see the fermenters, hot liquor tanks, and bottling line. 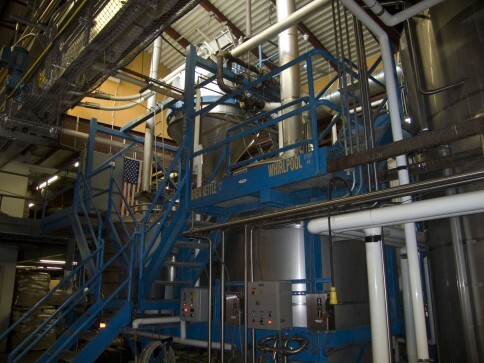 This operation is definitely high tech, compared to Peter Austin brewing systems. Micro no more, but Harpoon IPA, also made with Cascade, goes down very easily (5.9%, 42 IBUs). I think they have improved the recipe since I drank it first in the late 1990s, or perhaps it’s just my palate again? In any case, a solid option. Harpoon Leviathan, their Imperial IPA, is hopped with Centennial, Chinook, Simcoe, and Amarillo throughout the boil, and despite its 120 IBUs, this was not unpleasantly bitter at all. At 10%, however, it was not an option for me, the driver. Harpoon’s UFO range, “UnFiltered Offerings,” brewed since 1998, offered up a very nice Pale Ale, at 5.3% and with 34 IBUs, it is refreshing, clean-tasting, with a bitter finish. Very drinkable indeed. The UFO White was very biscuity, in fact, the torrified wheat flavours dominated it in the end. Definitely rather on the sweet spectrum of wheat beers (4.8%). Pugsley’s Signature Series was a delightful new discovery, clearly, a chance for Pugsley to play around with some bigger, bolder flavours and styles. One of the results is the XXXX IPA. Brewed with Cascade, Warrior, Nugget, and Glacier, this 9.25% IPA packs a grapefruity punch. 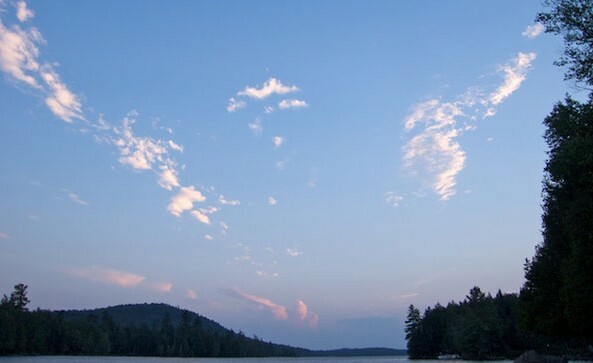 Its won a few accolades, both nationally and internationally, and rightfully so. 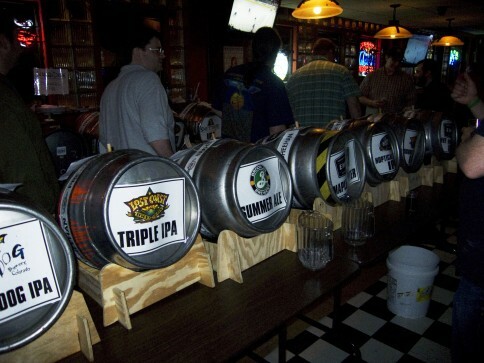 If you’re headed to New England or the Northeast you will not be lacking great beer choices and some will perhaps seem a bit closer in style to these shores than anticipated. In any event, you may only find yourself lacking enough time to sample as many as possible. Bryson, Lew. 2003. 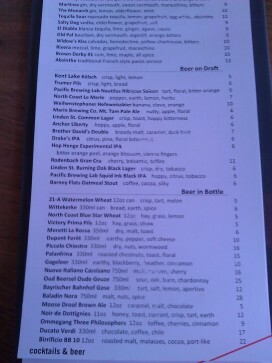 New York Breweries. Stackpole Books, Mechanicsburg, PA.
Crouch, Andy. 2006. 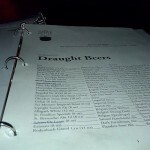 The Good Beer Guide New England. University Press of New England, Lebanon, NH.